I recently tried using a DA (15mm throw with 6” medium pad attached) for the first time after watching many YouTube videos but obviously that’s not the best way to learn. I’ve experienced two things that make me think my technique is wrong. 1. After putting 4 “pea” sized squirts of a medium compound on the pad and starting slowly before moving up to about 5/6 speed, the product is flinging quite a bit. 2. The polish was really hard to get off after, like it was really dry. I tried doing less passes before wiping it off and it was much easier but then I seemed to make no impact on the swirl marks. I’d be super grateful for any suggestions. Quick questions about what compound are you useing, what pad and which DA polisher? The machine has a 5” backing plate and 15mm throw. The guy at the shop recommended against using a medium cutting compound because as a noob I might do more harm than good. The pad the on the left was advertised as a medium cutting pad, and the one on the right is the former of the two that came with the DA. First, I am not formula with the polish, you`re using but it appears to be very dusty. He is a few thoughts. I don’t think you`re getting enough lubrication and your pad might be too dry. For the pad, I would suggest rinsing the pad in water and ring out to get as much water out. I would then put the pad on your DA and start off slow and work up to 4 or 5 to get the remaining water out, this will also help prime the pad. Then work on a test area 2 X 2 area. I would try spraying a little water first on the test area. Now put your polish on the pad and press the pad a few times in the test area and with the DA on 1, spread the polish over the 2 X 2 area. One you di that, try working your DA on 4 and the polish less to right - then up and down. Make 4 passes and whip down and inspect your work. First, is that polish designed for machine use? Second get an easier one step product to start out with. Welcome to the Forum, Phatrs ! If you have a 5" backing plate, then you can only use pads for that backing plate which will be a little bigger in diameter. The 6" pad is never going to be good on a 5" backing plate, ok ? I know nothing of your Australian Paint Cleanse and Restore, so I cannot help with that.. I always use a liquid pad conditioner spray bottle and wet the pad all over but not too much..
You will learn what works for you if you do it a few times. You need way more than 1 pad to do anything on any vehicle.. Typically, I can use 6+ pads, just to start cleaning up the paint. Then, there may be more pads of a different type if the paint needs polishing, or if I have to use the Coating Manufacturer`s polish before I coat the vehicle, for example.. The way I prime any foam pad is to first, as I said already, spray the pad with pad conditioner so its uniformly damp all over. Then I take some product, and never do pea size things, I just put some all around the pad and spread it out uniformly with my finger.. It will take a little practice to get the hang of it but you will learn how much of these things to apply initially, and then you back off the amount of product as you go, because the pad has some already..
Something else I have had great success with is wiping down the pad after doing the work on that spot on the panel. I use these cheap white cotton towels so I can see the color of what is coming off the paint.. If you really did good and corrected that spot, there will be all this dead paint, etc., now on the pad, as well as on the microfiber or whatever media you use when you wipe it off. I know from experience, that the cleaner the pad is each time it touches the paintwork, the more effective it is on that spot.. Its just common sense.. So, you need more than 1 - 5.25" foam pad.. You might want to think about purchasing better pads.. I hate that gray one.. I will never use a pad with that design..
Tell us what pad manufacturers are available to you if you are indeed located in Australia..
You need several pads that are just going to correct the defects. You need a way to clean the pads when you are done with the work so you can use them again.. It takes perhaps a couple of days for them to dry in the garage, for example.. Hotter weather of course, will help dry them faster.. I use a specific foam pad cleaner made by the people who make their own foam pads.. It works really great, and has never done anything bad to a zillion pads I have cleaned for years..
You need a long extension cord to attach to your machine..
You need really good lighting above the work so you can see how it is progressing while you are doing it.. Thank you everyone for the awesome advice. I will definitely invest in more pads, make sure I prime them before use, and clean them. I also have Meguiars Ultimate Compound. Is that considered a one-step polish? Sadly the pad options in Australia are very limited, and what’s available in the stores are just no-name or the brand of the store, and made in China. There are a few detailing websites here such as this one (link removed), so to get 5 or 6 of them I’m looking at $90 (US$65). At least it’s a European pad. I was hoping to do this with one pad. Such noob. Would cleaning it regularly be possible? I saw your introdusing post and noted you have VW. Those is knowned to have rock hard clearcoats. The Meguiars Compound could make a little cut on your cars. But I would wait until you get a good polish. If you would have less of results from the Megs compound. I would take a look at the Car Craft Auto Detailing Channel on Youtube. Sandro is in Australia so you could see the links he gives under the video. And an awesome channel he has too. He have some good trix to show. And has also done a lot of testing out of products. Rupes yellow foam pad is an awesome polishing pad. Scholl blue spider pad is a great medium cut foam pad on hard clearcoats. Meguiars mf cutting pad for compound and if more cut is needed you have the wool pads for DA polishers. Depending on what you can get for polish and compound. The bigger more knowned brands makes great polishes. Meguiars, Carpro, Menzerna, Scholl and Sonax to name a few. But always do a test spot to inspect your results and start with the least aggressive combo that have and work your way up in aggressiveness. Just remember to not use the same test spot as your results will be from what you used on it. Ultimate compound should make a dent in all but the worst siwrls. I would try a test area with that. You will also want to use something like IPA to remove the oils it leaves behind when you check your results. While I realize that you won`t like this response, IMO you oughta be doing far more research before trying to do this stuff. Not watching YouTubes, but rather learning/understanding the concepts/processes/physics involved so you understand this stuff inside-and-out before you start. It`s pretty simple stuff and once you understand it things oughta go very smoothly right from the jump. Trying to do it without a complete understanding will be much harder IMO. At least learn what types of pads are used for what kinds of work, and what the major Product Categories are all about. Do you have proper Inspection Lighting? That is *absolutely critical*. No, it`s a Compound. Compounds are more aggressive than Polishes and require a follow-up (generally with a Polish) to remove the micromarring that Compounds leave behind when the "sand down" the scratches/swirls. A One-Step Polish will not be as aggressive as a Compound, so it won`t remove deeper marring (at least not as quickly), but it`ll leave a nicer finish and just "making things better but not perfect" is a good initial goal when you`re starting out. There are All-In-One products that are *real* One-Step products since they combine a mild Polish with Paint Cleaners and some kind of (generally short-lived) protection. These are typically *VERY* user-friendly and can be a great way to start. While I like high speeds like that, many (most?) others would limit it to about "4". You don`t want the product to dry out too fast. Also, work *SMALL* areas at a time until you`re dialed-in; I would not (and DON`T) do the "two-foot square" size area that many advocate, way too big for me in most situations (and I`ve been doing this stuff since forever). Is that "four pea-sized.." approach the proper method to prime using the product in question? I don`t know that product, but different products can call for very different priming approaches. I assume you`re keeping the pad in relatively firm contact with the vehicle, and keeping it pretty flat. You must`ve overworked the product and/or let it dry before buffing it off. Virtually all Compounds/Polishes...*BUT NOT AIOs* are buffed off while still a little "wet", before they dry. Doing significant correction on hard clear can take a *LONG* time! Even with really aggressive products (and I doubt the stuff you used is like that). It can *really* take forever when you have to stop frequently to buff off the product, strip the Polishing Oils (I find IPA terrible for this compared to dedicated products made for the job), inspect your progress (with that perfect Inspection Lighting ), clean the pad (or get out a new one), reprime the pad with fresh product, and get back to work. Just the way it is. 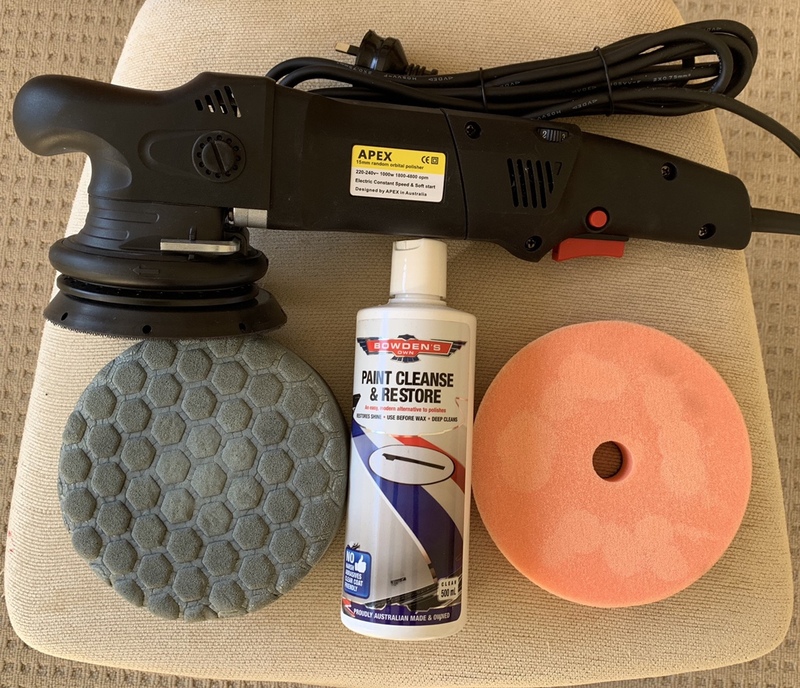 Upping the aggressiveness (e.g., using a Microfiber Cutting Disk instead of a foam pad, using a very aggressive Compound like Meguiar`s M101) can speed things up, but will also take off more clear faster and make the chance of a serious "oops!" more likely, so it`s always a trade-off. I`ll repeat the "aim for `better` instead of perfect". I`d work a very small area until you get it the way you want it...or until you either think "Oh man, enough already!" or until you start to think you`ve taken off enough clear (you can`t take off much without precipitating failure). Pick some area that`s 1) representative of the vehicle`s overall condition marring-wise, and 2) pretty easy to work on/inspect, and try to get that one area "good enough" whatever that means to you. That`ll give you a better idea of what`s going on and how that matches up with what you want. Again, I realize my response is quite probably not what you`re after, but I do hope that something in the above is useful. It`s entirely possible for somebody to research this stuff and then pick up a polisher and do fine *the very first time*..as long as they define "doing fine" in a realistic manner. Don`t expect to get the exact same results as somebody who`s done this for a few decades, at least not at first. Remember that your polisher is merely "a fast hand that doesn`t get fatigued", it`s just moving the pad/product across the surface the same way you`d do it by hand. I agree with many of the above recommendations. 2. After applying the product on the pad (I like to use a thin "X" pattern), using a latex glove, I rub the product into the pad. 3. Start out slow, build up to the speed I need and before it totally "dries", drop the speed back down and then wipe the remaining residue off. 4. Anytime ( and it is very rare) that I get the "thick", "caked on" product that you mention, a 70/30 mixure of IPA will remove it very easily. 5. Lastly, make sure you are working on a cool, dry vehicle. I hope my 2 cents helps. Meguiars Ultimate Polish is pretty newbie friendly. If you want to order something on line, then Griots Boss polishes have a good reputation. That’s exactly what I needed to hear. I’m a software engineer by day and I firmly believe in understanding how to do things the right way, and to understand how your tools and products work. So thank you for taking your time and so generously writing your response. I discovered a series of tutorials from Ammo NYC so I’m going to watch all of them first, and definitely take all of your advice. Thank you for these suggestions. I’m yet to come across a YouTube vid that just focuses on priming technique, so I’ll give this a go. To everyone who has replied I’m really grateful for the time you’ve taken to share your knowledge. I’ve clearly got lots of learning to do. Sadly I’ve got a bunch of timber doors to strip and lacquer before I can touch my DA polisher but I hope to put all the suggestions into practice in a week or so. I’ll report back with photos. Again, thanks everyone! Help the noob: wrong product, wrong pad, or wrong technique ? HELP, what did I do wrong?